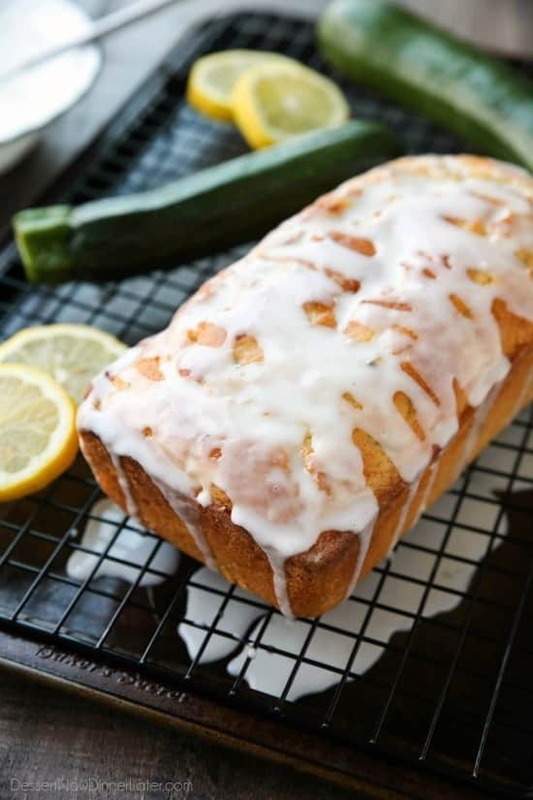 Lemon Zucchini Bread - Dessert Now, Dinner Later! 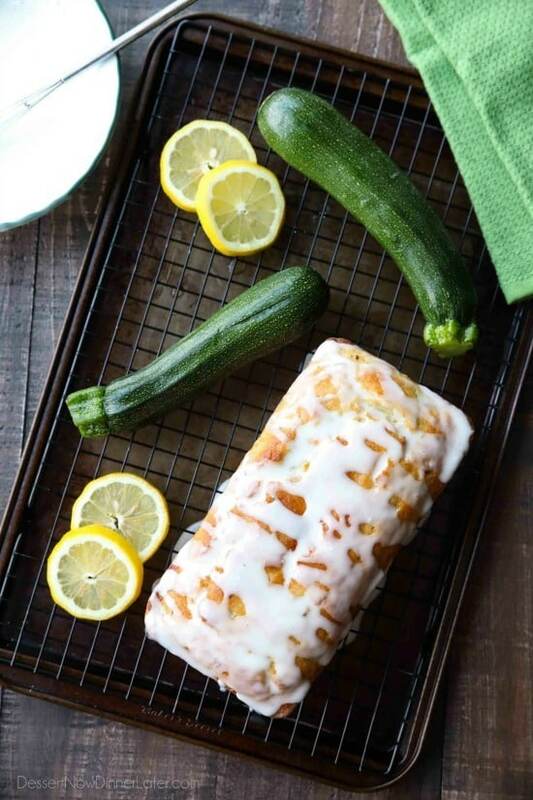 Lemon Zucchini Bread combines two favorites into one easy-to-make loaf! 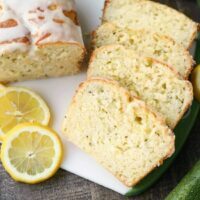 The fresh summer zucchini keeps this cake incredibly moist, and the zesty lemon flavor is tangy and sweet. 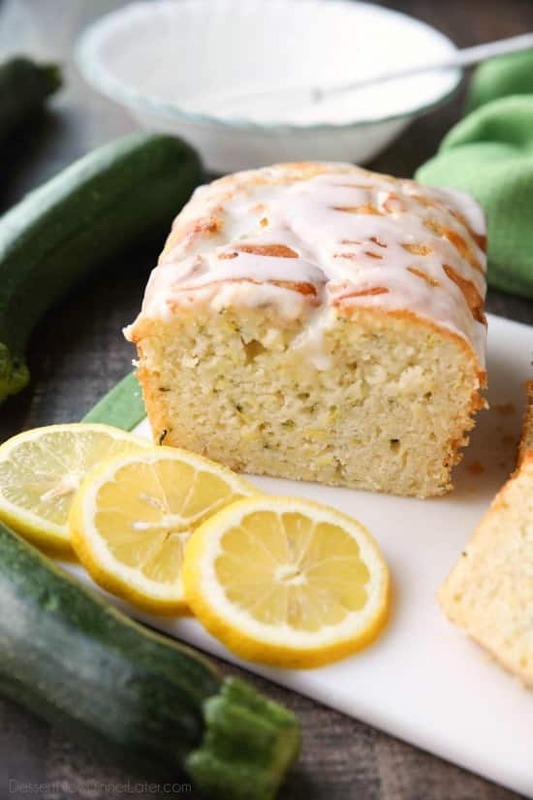 My garden zucchini is kicking it into high gear, so it’s time for some tasty zucchini recipes. 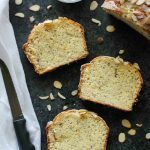 Growing up, my mom would always make chocolate zucchini cake — another recipe I need to put on the blog, but I went for a totally different flavor combo today: Lemon Zucchini Bread! I’ll be honest, I was worried that I was going to taste the zucchini a lot and it would seem more savory than sweet, but it worked out really well. 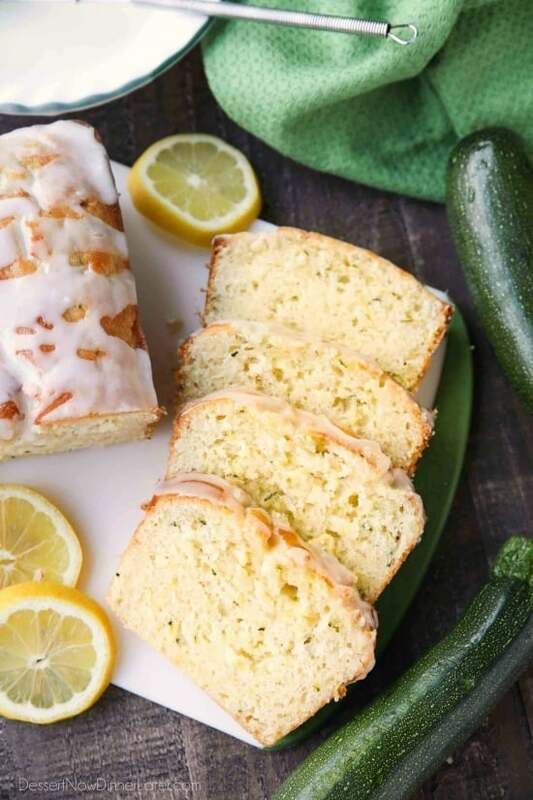 The zucchini keeps the bread very moist and the lemon is tangy and sweet. 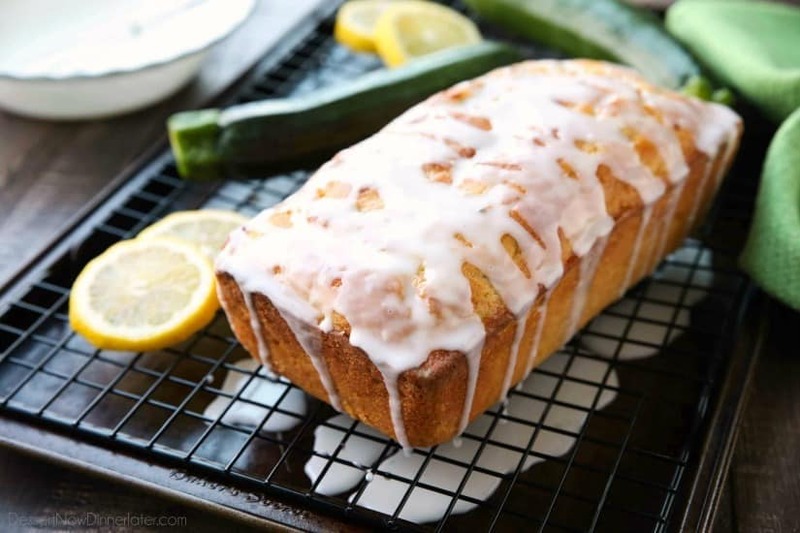 The lemon glaze on top is my favorite part. Probably because it’s gives it an added boost of lemon flavor. 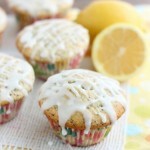 I just can’t get enough citrus desserts! This year we grew green and yellow zucchini. I bet if I had used the yellow zucchini, it would have been hidden better for my kids. Although, they still ate it and liked it, even with the green specks. If you are trying to hide veggies for your kids, you can always peel the zucchini first. I think the green specks are pretty, and it’s one less step. 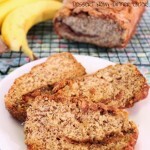 This is a quick bread though. Easy to whip up. Baking is the longest part. And waiting for it to cool long enough for the glaze to stick, but it’s so worth it! Give this recipe a try! I’m betting you’ll like it! Preheat oven to 350 degrees Fahrenheit. Butter and flour an 8x4-inch loaf pan. Set aside. In a medium mixing bowl whisk the flour, baking powder, and salt. Set aside. In the bowl of a stand mixer fitted with the paddle attachment, mix the sugar and lemon zest until fragrant; about 30 seconds. Add oil, eggs, sour cream, and lemon juice. Mix. Add flour mixture. Mix gently until flour is about halfway incorporated. 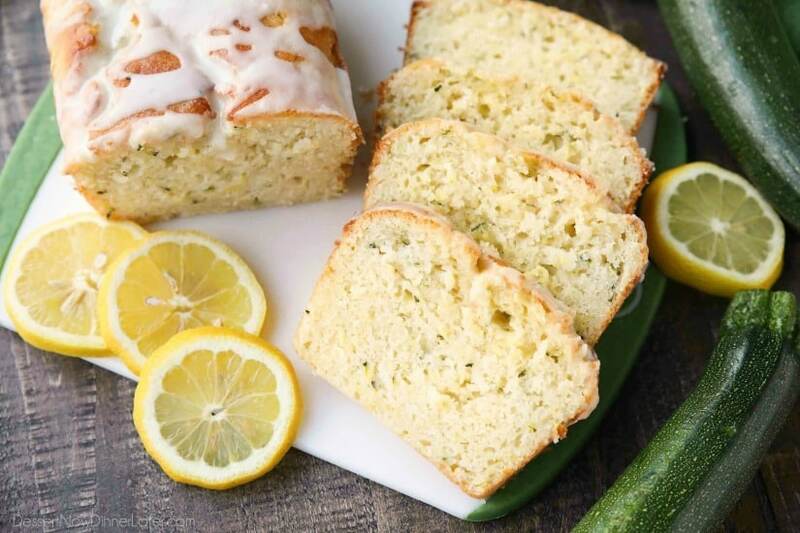 Fold in zucchini with a spatula until flour leaves only a few streaks. Do not over-mix. Pour batter into the prepared loaf pan. Bake for 40 to 45 minutes, until a toothpick inserted into the center comes out clean. Let cool in the pan for a few minutes, then invert bread onto a wire rack to cool completely. 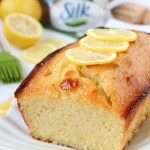 Once loaf is cool, mix glaze ingredients in a bowl with a whisk and drizzle over the top; let set. Slice and serve. Store bread in an airtight container.